Watch live stream starting at 7 p.m. ET. Watch live stream starting at 8 a.m. ET. Watch live stream starting at 5 p.m. ET. 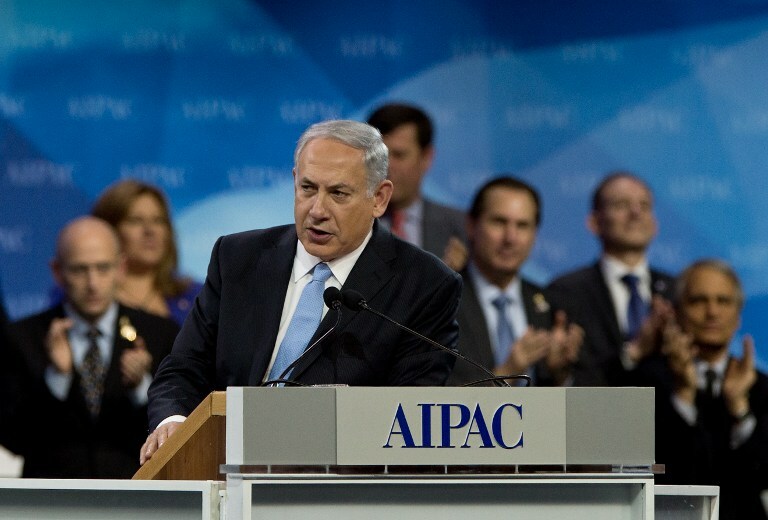 Below is the full transcript of Israeli Prime Minister Benjamin Netanyahu’s remarks at the March 4th, 2014, AIPAC Policy Conference in Washington D.C. Thank you. Thank you very much. Thank you. Thank you. My friends, I’ve — I’ve come here to draw a clear line. You know that I like to draw lines — (laughter) — especially red ones. But the line I want to draw today is the line between life and death, between right and wrong, between the blessings of a brilliant future and the curses of a dark past. I stood very close to that dividing line two weeks ago. I visited an Israeli army field hospital in the Golan Heights. Now, that field hospital wasn’t set up for Israelis. It was set up for Syrians. (Applause.) Israelis treated nearly a thousand wounded Syrians — men, women and a lot of children. They come to our border fence bleeding and desperate. Often they’re near death. And on my visit I met two such Syrians, a shellshocked father and his badly wounded 5-year-old boy. A few days earlier the man’s wife and baby daughter were blown to bits by Iranian bombs dropped by Assad’s air force. Now the grieving father was holding his little boy in his arms, and Israeli doctors were struggling to save the boy’s life. That border, that runs a hundred yards east of that field hospital, is the dividing line between decency and depravity, between compassion and cruelty. On the one side stands Israel, animated by the values we cherish, values that move us to treat sick Palestinians, thousands of them, from Gaza. They come to our hospitals. We treat them despite the fact that terrorists from Gaza hurl thousands of rockets at our cities. It’s those same values that inspires Israeli medics and rescuers to rush to the victims of natural disasters across the world, to Haiti, to Turkey, to Japan, the Philippines, to many other stricken lands. And what the — what the Iranian people — or rather, what the Iranian regime does abroad is just as — is similar to what they do to their own people. They execute hundreds of political prisoners, they throw thousands more into their jails, and they repress millions in a brutal theocracy. If you want to understand the moral divide that separates Israel from its enemies, just listen to Hassan Nasrallah, the head of Hezbollah, Iran’s terror proxy in Lebanon. He said this. He said: Iran and Hezbollah love death and Israel loves life. And that’s why, he said, Iran and Hezbollah will win and Israel will lose. In the past year Iran’s radical regime has tried to blur this moral divide. It wields out its smiling president and its smooth- talking foreign minister. But if you listen to their words, their soothing words, they don’t square with Iran’s aggressive actions. Iran says it only wants a peaceful nuclear program. So why is it building a heavy water reactor, which has no purpose in a peaceful nuclear program? Iran says it has noting to hide. So why does it ban inspectors from its secret military sites? Why doesn’t it divulge its military nuclear secret — the secrets of its military nuclear activities? They absolutely refuse to say a word about that. Iran says it’s not building nuclear weapons. So why does it continue to build ICBMs, intercontinental ballistic missiles, whose only purpose is to carry nuclear warheads? See, unlike Scud missiles, that are limited to a range of a few hundred miles, ICBMs can cross vast oceans. And they can strike, right now or very soon, the Eastern seaboard of the United States — Washington — and very soon after that, everywhere else in the United States, up to L.A.
Now, it’s not only that — only the Americans got that joke. (Laughter.) It’s not only that Iran doesn’t walk the walk. In the last few weeks, they don’t even bother to talk the talk. Iran’s leaders say they won’t dismantle a single centrifuge, they won’t discuss their ballistic missile program. And guess what tune they’re singing in Tehran? It’s not “God Bless America,” it’s “death to America.” And they chant this as brazenly as ever. Some charm offensive. My friends, yesterday I met with President Obama, with Vice President Biden, with Secretary Kerry and with the leaders of the U.S. Congress. We had very good meetings. I thanked them for their strong support for Israel — (applause) — for our security, including in the vital area of missile defense. I said that the greatest threat to our common security is that of a nuclear-armed Iran. We must prevent Iran from having the capability to produce nuclear weapons. And I want to reiterate that point. Not just to prevent them from having the weapon, but to prevent them from having the capacity to make the weapon. (Applause.) That means — that means we must dismantle Iran’s heavy water reactor and its underground enrichment facilities. We must get rid of Iran’s centrifuges and its stockpiles of enriched uranium and we must insist that Iran fully divulge the military dimensions of its nuclear program. Now 17 countries around the world have peaceful nuclear energy programs. They’re doing this without spending centrifuges, without enriching uranium, without operating heavy water facilities and without conducting military nuclear research. You know why Iran insists on doing all these things that the other peaceful countries don’t do? It’s because Iran doesn’t want a peaceful nuclear program, Iran wants a military nuclear program. I said it here once, I’ll say it here again: If it looks like a duck, if it walks like a duck, if it quacks like a duck, then what is it? Well, it’s ain’t a chicken — (laughter) — and it’s certainly not a dove. It’s still a nuclear duck. (Applause.) Unfortunately, the leading powers of the world are talking about leaving Iran with the capability to enrich uranium. I hope they don’t do that because that would be a grave error. It would leave Iran as a threshold nuclear power. It would enable Iran to rapidly develop nuclear weapons at a time when the world’s attention is focused elsewhere. And we see, as we speak, that that could happen. In one part of the world today, tomorrow in another part — maybe North Korea. So just remember what — (inaudible) — wrote a few years ago. He wrote this in a rare moment of candor. He said: If a country can enrich uranium, even to a low level, it can effectively produce nuclear weapons. Precisely. And leaving Iran as a threshold nuclear power, would deliver a death-blow to nonproliferation. Iran is an outlaw state. It’s violated multiple U.N. Security Council resolutions prohibiting enrichment. If we allow this outlaw terrorist state to enrich uranium, how could we seriously demand that any other country not enrich uranium? My friends, I believe that letting Iran enrich uranium would open up the floodgates. It really would open up a Pandora’s box of nuclear proliferation in the Middle East and around the world. That must not happen. (Applause.) And we will make sure it does not happen. Because letting the worst terrorist regime on the planet get atomic bombs would endanger everyone, and it certainly would endanger Israel since Iran openly calls for our destruction. Now you know how you get that agreement with Iran? Not by relieving pressure but by adding pressure. (Applause.) Pressure is what brought Iran to the negotiating table in the first place, and only more pressure will get to abandon their nuclear weapons program. Greater pressure on Iran will not make war more likely; it will make war less likely — (applause) — because the greater the pressure on Iran, the greater the pressure on Iran and more credible the threat of force on Iran, the smaller the chance that force will ever have to be used. Ladies and gentlemen, peace is Israel’s highest aspiration. I’m prepared to make a historic peace with our Palestinian neighbors — (applause) — a peace that would end a century of conflict and bloodshed. Peace would be good for us. Peace would be good for the Palestinians. But peace would also open up the possibility of establishing formal ties between Israel and leading countries in the Arab world. Why? Because of technology, of innovation, of systems. We could make that available to our Arab neighbors throughout the region that is not exactly blessed with water. We could solve the water problems. We could solve the energy problems. We could improve agriculture. We could improve education with e-learning, health with diagnostics on the Internet. All of that is possible. We could better the lives of hundreds of millions. So we all have so much to gain from peace. That’s why I want to thank the indomitable John Kerry. You know, New York — (applause) — and Tel-Aviv, they’re the cities that never sleep. John Kerry is definitely the secretary of state who never sleeps. Israel is the nation-state of the Jewish people — (applause) — where the civil rights of all citizens, Jews and non-Jews alike, are guaranteed. The land of Israel is the place where the identity of the Jewish people was forged. Now, my friends, it may take years, it may take decades for this formal acceptance of Israel to filter down through all layers of Palestinian society. So if this piece is to be more than a brief interlude between wars, Israel needs long-term security arrangements on the ground to protect the peace and to protect Israel if the peace unravels. You see, those security arrangements would always be important, but they’re even more important and critical today when the entire Middle East is unraveling. Three years ago, our region was a very different place. Can anyone sitting here, anyone listening to us, can anyone tell me and be sure what the Middle East will look like five, 10, 20 years from now? We cannot bet the security of Israel on our fondest hopes. You know, in the Middle East, that’s usually a losing bet. We should always hope for the best, but in the Middle East we have to be prepared for the worst. And despite the best of hopes, international peacekeeping forces sent to Lebanon, Gaza, Sinai, the Golan Heights, they didn’t prevent those areas from becoming armed strongholds against Israel. If we reach an agreement, as I hope, with the Palestinians, I don’t delude myself. That peace will most certainly come under attack — constant attack by Hezbollah, Hamas, al-Qaida and others. And experience has shown that foreign peacekeepers — foreign peacekeeping forces, well, that they keep the peace only when there is peace. I’m going to reveal to you a secret. This position may not win me universal praise. So as we work in the coming days, in the coming weeks, to forge a durable peace, I hope that the Palestinian leadership will stand with Israel and the United States on the right side of the moral divide, the side of peace, reconciliation and hope. You can clap. You want to encourage them to do that. (Applause.) I do, and I know you do too. Let me tell you why. (Sustained applause.) I want to explain to you why. Beyond our traditional trading partners, countries throughout Asia, Africa, Latin America, where I’ll soon be going to, these countries are flocking to Israel. They’re not coming to Israel; they’re flocking to Israel. They want Israeli technology to help transform their countries as it has ours. And it’s not just the small countries that are coming to Israel, it’s also the superpowers. You know, the other superpowers: Apple, Google — (laughter) — Microsoft, Intel, Facebook, Yahoo. They come because they want to benefit from Israel’s unique ingenuity, dynamism and innovation. Most people in the BDS movement don’t seek a solution of two states for two peoples. On the contrary, they openly admit that they seek the dissolution of the only state for the Jewish people. They’re not seeking peace, they’re not seeking reconciliation. But some of their gullible fellow travelers actually do believe that BDS advances peace. Well, the opposite is true. BDS sets back peace because it hardens Palestinian positions and it makes mutual compromise less likely. But the BDS movement is not about legitimate criticism. It’s about making Israel illegitimate. It presents a distorted and twisted picture of Israel to the naive and to the ignorant. BDS is nothing but a farce. Here’s why, listen: In dozens of countries academics are imprisoned for their beliefs. So the universities of which country does BDS want to sanction and boycott? Israel — the one country in the Middle East where professors can say, write and teach what they want. Now, when you hear this — and anybody can verify this — so you have to wonder, how could anyone fall for the BS in BDS? (Laughter, applause.) How can they fall for this? Well, you shouldn’t be surprised. Throughout history, people believed the most outrageously absurd things about the Jews, that we were using the blood of children to bake matzos, that we were spreading the plague throughout Europe, that we were plotting to take over the world. Yeah, but you can say how can educated people, how could educated people today believe the nonsense spewed by BDS about Israel? Well, that shouldn’t surprise you either. Some of history’s most influential thinkers and writers — Voltaire, Dostoyevsky, T.S. Eliot, many, many others — spread the most preposterous lies about the Jewish people. It’s hard to shed prejudices that have been ingrained in consciousness over millennia. And from antiquity to the Middle Ages to modern times, Jews were boycotted, discriminated against and singled out. Scarlett, I have one thing to say to you: Frankly, my dear, I DO give a damn. (Applause.) And I know all of you give a damn, as do decent people everywhere who reject hypocrisy and lies and cherish integrity and truth. My friends, on behalf of the people of Israel, I bring you message from Jerusalem, the cradle of our common civilization, the crucible of our shared values. It’s a message from the Bible. (In Hebrew.) (Applause.) I have put before you life and death, the blessing and the curse. Choose life so that you and your offspring may live. Ladies and gentlemen, my friends, never forget — America and Israel stand for life. We stand together on the right side of the moral divide. We stand together on the right side of history. (Applause.) So stand tall, stand strong, stand proud. (Cheers, applause.) Thank you. Thank you. (Applause.) Thank you very much. Thank you all. Keep doing a great job. (Applause.) Thank you. Norm, thank you. Thank you very, very much. Thank you all, 14,000 strong or more. (Applause.) Howard, Howard Friedman and Executive Director Howard Kohr, incoming president Bob Cohen, incoming chairman Michael Kassen, outgoing chairman Lee Rosenberg, and Ambassador Ron Dermer and Ambassador Dan Shapiro. I don’t know where our ambassadors are. Would they – somebody ought to applaud both of them here. (Applause.) There they are. Thanks for your own, Norman. Let me tell you, it really is an enormous pleasure for me to be able to be here. It’s a privilege. And good to see so many friends, all 14,000 of you – a little frightening to see myself on about eight, nine, ten screens up here – (laughter). The last time I spoke to AIPAC, I joined your national summit in Napa Valley. I did it via satellite. And you were in the vineyards, I was overseas – a different kind of vineyard. So today, I think I’m getting the better end of the deal because I am here with you in person, and your wine selection is a lot more limited this time. I want you to know that in my judgment, these democratic values are stamped in the DNA of both the United States and Israel. But we also share something much deeper than that. Like no other two countries on the planet, against the deepest odds, both America and Israel confidently, purposefully set out to be examples to the world. Think about it. From its earliest days, Israel has always said it’s not enough just to be one of many in a community of nations; Israel has strived since Isaiah’s time to serve as a light unto the nations. (Applause.) And that responsibility to be a light unto the nations sounds actually unbelievably similar to something that we as Americans know is part of who we are, too. My grandfather ten times over – too hard to count in other terms – was a man by the name of John Winthrop. And he came to what was then the New World, and he came in search of freedom, freedom to worship as he wished. He was a minister. He and his congregants were outcasts, persecuted, heading into a rough and unforgiving land with no guarantee even of survival. And on his way here, he delivered a now fairly famous sermon at sea in which he called on his community to create a city upon a hill in their new home, America. Now, to do that, to achieve this all-important goal, important for America’s security and for Israel’s security, it is crucial that we seizes what might be the last best chance to be able to have diplomacy work, and maybe the last chance for quite some time. Because the reality is only strong diplomacy can fully and permanently achieve the goal. Those who say strike and hit need to go look at exactly what happens after you’ve done that, whether that permanently eliminates the program or opens up all kinds of other possibilities, including Iran leaving the Nuclear Proliferation Treaty, not even allowing IAEA inspectors in, not living under any international regimen. That’s a possibility. Only strong diplomacy can guarantee that a nuclear weapons program actually goes away for good instead of just going underground and becoming more dangerous. Only the exhaustion of diplomacy can justify more forceful options if you have to take them in the end. So we say – President Obama and myself and others – we say let’s seize the diplomatic moment. And that’s what we are trying to do. And the truth is it is strong diplomacy that has actually made this moment possible. And we need to give it the space to work. We need to make sure that if this opportunity were to elude us, it is not because we are the ones that close the window. Now, we have taken no options off the table, but so far there is no question but that tough sanctions and strong diplomacy are already making Israel and America safer. The first step agreement, the first step agreement – it’s not an interim agreement, it’s a first step agreement – and the agreement that’s in force today didn’t just halt the advance of the Iranian nuclear program for the first time in a decade; it’s actually rolled it back. And we all remember how Prime Minister Netanyahu highlighted Iran’s 20 percent enriched uranium in the 2012 speech at the United Nations. Well, today Iran is reducing its stockpile of 20 percent uranium. And without the agreement in force today, the opposite would have been in effect. The stockpile would have grown even more dangerous, and the amount of breakout time that they have would have grown smaller. Because of the agreement, Iran will soon have to take its entire stock of 20 percent enriched uranium down to zero. Zero. Zero. (Applause.) You don’t have to be a math major to know that Israel is safer when Iran has zero uranium enriched to 20 percent, and that’s what we’ve achieved. None of these things would have happened without forceful diplomacy by the United States and our international partners. But now, my friends, we have to finish the job. Like I tell my staff, there aren’t any exit polls in foreign policy. It’s results that count, final results. And that means we have to let forceful diplomacy keep working in order to put this test to Iran. Now, right now we are carefully – and I mean carefully – negotiating a comprehensive agreement. We are consulting with our friends in Israel constantly. The minute Under Secretary Wendy Sherman finished her last set of meetings in Vienna the other day, she went immediately to Israel, briefed thoroughly on the talks, then went to Saudi Arabia and the United Arab Emirates and continued to brief and briefed our European partners. You might be asking: If no deal is better than a bad deal, what does the United States consider a good deal? Well, you have my word – and the President’s – that the United States will only sign an agreement that answers three critical questions the right way. First, will it make certain that Iran cannot obtain a nuclear weapon? Second, can it continuously assure the world that Iran’s program remains entirely peaceful as it claims? And third, will the agreement increase our visibility on the nuclear program and expand the breakout time so that if they were to try to go for a bomb, we know we will have time to act? Those are the tests. Those are our standards for any comprehensive agreement. It’s that simple. And those objectives, if they’re not met, then there won’t be an agreement. (Applause.) Now make no mistake, make no mistake; we can’t resolve the answer to those questions. It’s up to Iran. It’s up to Iran to prove to the world that its program is peaceful, and the world will hold Iran accountable. Now, strong diplomacy is also essential to another threat to Israel’s security: ending the conflict with the Palestinians, and in doing so, preserving the Jewish and democratic nature of the state of Israel. (Applause.) I’ve had some folks ask me why I’m so committed to these negotiations and why I’m so convinced that peace is actually possible. And they ask, “Why does John Kerry go to Israel so often?” I think I heard Steny Hoyer say he’d been there 13 times, Eric Cantor who’s been there 12 times. I’ve been there more times than that just in the last nine months. (Laughter.) And I’ve been in the Middle East more times than even that in the last months because I don’t always wind up going to Israel. Now, it’s not news to any Israeli to hear me say that they live in a difficult neighborhood. Israelis know that better than anyone. No one needs to explain the importance of peace and security to a mother who has just sent her daughter to the army or a son who is waiting for his father to come home from another mission. No one knows the stakes of success or failure better than those who will inherit them for generations to come. And I have seen all of these realities in so many different ways in my travels in Israel, from the rocket casings in Sderot to the shelter in Kiryat Shmona that I visited years ago where children had to hide from Katyusha rockets. I’ve seen it. My friends, I also believe that we are at a point in history that requires the United States as Israel’s closest friend and the world’s preeminent power to do everything we can to help end this conflict once and for all. Now, that is why America – (applause) – that is why America helped bring the parties back to the table, where, let’s be honest, Israelis and Palestinians have difficult choices to make. And no one understands just how complex those choices are or how emotional they are better than the leaders who have to summon the courage in order to actually make them. Thus far, I will tell you also that President Abbas, and I know there are many doubters here – I’ve heard the arguments for 30-plus years, 40 years – that there’s no partner for peace, that Abbas won’t be there, that – both sides, by the way, say the same thing about each other. That’s one of the difficulties we have to try get through here. A very small needle to try to thread in terms of the trust deficit. Thus far, President Abbas, I will tell you, has demonstrated he wants to be a partner for peace. He’s committed to trying to end the conflict in all of its claims, but he obviously has a point of view about what’s fair and how he can do that. Let’s be candid. I know that some of you doubt that. But as Israeli security officials will attest, President Abbas has been genuinely committed against violence, and his own security forces have worked closely with Israel in order to prevent violence against Israeli citizens. And so does Prime Minister Netanyahu. When Bibi looks me in the eye and says, “I can’t accept a deal with Palestinians that doesn’t make the people of Israel safer,” we agree 100 percent. (Applause.) But I argue that there is a distinction between a unilateral withdrawal from Lebanon or from Gaza where nothing is resolved, and a phased withdrawal that is negotiated where everything is at least in an agreement resolved. That is why, my friends, President Obama sent a four-star general, John Allen, one of the most respected minds in United States military to do something we’ve never done in all the history of administrations negotiating for Israel’s and Palestinians’ future and that is to work with Israelis and Jordanians and Palestinians to make the Jordan River border as strong as the strongest borders on Earth. That’s what makes this effort different from anything we’ve ever done before. With the combination of the best military experience America can offer and the best ideas in the Pentagon and the best technology that we could deliver, we believe we can deliver to Israel security that Israel needs in order to make peace, and President Obama is committed to doing that. My friends, we understand that Israel has to be strong in order to make peace. But we also understand that peace will make Israel stronger. Any peace agreement must also guarantee Israel’s identity as a Jewish homeland. (Applause.) As Ehud Barak said on this stage last year, a two-state solution is the only way for Israel to stay true to its founding principles – to remain both Jewish and democratic. At last year’s AIPAC conference, he said statehood is not a favor for the Palestinians, and let me reaffirm: He is right; it is not. Finally, peace demands that Israel fulfill its destiny not just as a nation but also as a neighbor. And that begins with the Palestinians, and it extends to the entire Arab League whose Arab Peace Initiative can open the door to peace and normalized relations with 20 additional Arab countries and a total of 55 Muslim countries. The upheaval in the Middle East has shown us all that Arabs and Israelis share some of the very same security concerns. Without the Palestinian conflict to divide them, these common interests can grow into real relationships and transform Israel’s standing in the region. And I just invite you – I promise you these conversations take place. I’ve had them throughout the Gulf region, throughout the Middle East, where increasingly those countries begin to see the possibilities of mutual security interests coming together for all of them against an Iran, against terrorism, against religious extremism. This is a commonality that is a new thread in the region, and I believe it brings the potential of new possibilities. It is also important to remember that ending the conflict means ending the incitement. President Abbas has called incitement a germ that must be removed. And he has sought our help in order to try to deal with the problem. And I can tell you that with any final agreement it will also include a larger endeavor in order to help people on both sides move beyond a painful past and promote a culture of peace and tolerance. It will take hard work. I’m not pretending any of the answers – these are all narrative issues. They’re tough issues. They complicated. But there is a vision of peace, and it takes tough choices on both sides, especially over the coming days. I guarantee you that America, that President Obama and this Administration will be there every day of the week, every step of the way. And we will stand with Israel’s leaders today and with the leaders of the future. And we will ensure that our light shines not just throughout the nations, but throughout the generations. Leaders like a fellow named Guy – I’ll leave his last name out – but he’s a young Israeli who took part in an exchange program with the State Department, sponsors that brings Israelis and Palestinians together to talk about their histories and their hopes. Guy’s grandparents fled Europe. He was born and raised in Jerusalem. He served in the IDF. And he worked as an entrepreneur in Israel’s booming tech industry. And this is what he said in that program: We respect our past, but we don’t want to live it. We are young enough to dream, to believe that change is possible, and that fear can be defeated. I think Guy is right. Change is possible. Fear can be defeated. But those are choices we have to make now. My friends, a few months ago I landed in Tel Aviv and it was the 18th anniversary of Yitzhak Rabin’s assassination. I went straight to Kikar Rabin, and I stood with the late-prime minister’s daughter, Dalia, at the site of her father’s murder. And we stood just steps away from where the great general, in the last moments of his life, sang the famous lyrics of Shir LaShalom: Don’t whisper a prayer; sing a song of peace in a loud voice. Don’t say the day will come; bring that day. (Applause.) That is our mission. All of us, in whatever capacity that we can, but just as important our mission is also to raise our voices for peace, and we also need to listen. We have to listen to those who first gave voice to our values, voices that still echo thousands of years later. He almost – I think it was the first time I went to Israel. I spent a week there and went all over the country and like many first-time visitors, I climbed Masada. I climbed it with a guide – some of you may know him or heard of him, a fellow by the name of Yadin Roman. Yadin, the publisher of Eretz Israel. And our group debated Josephus Flavius’s account of what happened on the top of that mountain, the account of what happened 2,000 years before we were there. Then Yadin, after we’d had this long debate, made us all vote to determine did it happen as he recounted or was it different. And we all voted unanimously it did happen the way he recounted. He told us to then walk to the edge of the precipice which we did, and to look out across the chasm and to shout, to shout across the ancestral home of the Jewish people. And as we stood where every new Israeli soldier begins his or her service, by swearing an oath to honor that history and secure the future, Yadin instructed us to shout, all at the same time, “Am Yisrael chai.” We shouted. (Applause.) And then I have to tell you, echoing across the chasm in the most eerie and unbelievably unforgettable way were these haunting echoes of “Am Yisrael chai, Am Yisrael chai, chai, chai.” I’ll never forget hearing the echo of those words bouncing off that mountain. It was literally like we were hearing the voices of the souls of those who had perished sacrificing their lives for Israel a thousand years ago. And we were affirming those words, the state of Israel lives. The people of Israel live. We have to listen to those voices. Those long ago who encouraged us to build a city on a hill to be a light unto the nations, an example to the world, to ensure Israel’s survival. And we have to listen to the voices of young people whose futures depend on the choices that we, the leaders of today, make. It’s for their future that we will give new strength to the U.S.-Israel partnership as AIPAC does like no other organization in our country. It’s for their future that we will come together giving greater voice to the timeless oath and we will remember forever those words and be driven by them: “Am Yisrael chai” will be said generations upon generations into the future because of the work you do and the work we will do together. 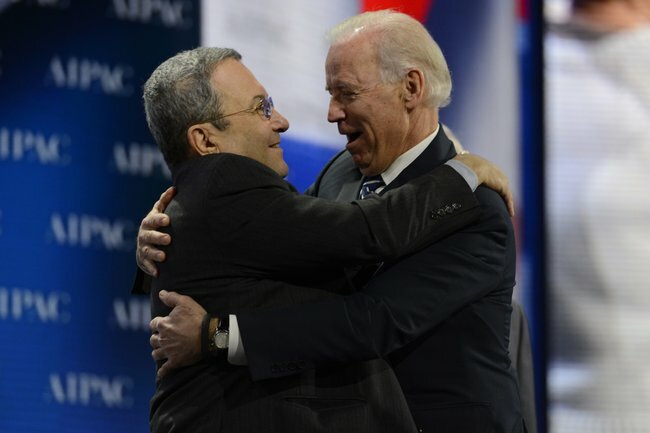 Vice President Joseph R. Biden Jr., right, with Israeli Defense Minister Ehud Barak at the American Israel Public Affairs Committee’s annual policy conference in Washington on Monday. Thank you, it is an honor to be here at AIPAC’s policy conference. And, it’s an honor to be here with my good friend, one of Congress’ strongest pro-Israel allies Steny Hoyer. Tonight, we celebrate a friendship between two countries. Simple in concept, but mighty in force. This friendship is centered on commitment to community and dedication to faith. It values education, human progress, and the guarantee of opportunity for all. With this friendship, the world is a better place. The alliance between the United States and Israel is often tested, but never shaken. We’ve helped protect each other. We’ve help protect our friends, and we’ve helped protect humanity. If there is a tsunami, our military and aid ships are the first to set sail. If disease is ravaging a nation, or as is the case of AIDS in Africa, an entire continent, we send help. And we save lives. Israel shares our moral compass. When massive earthquakes struck Haiti and Turkey, Israel was among the first to offer assistance. And hundreds of Israeli rescue workers responded to the deadly terrorist attacks in East Africa, saving the lives of Africans injured in the attacks on America’s embassies. For those of us who have visited Israel, you know what a special place it is. You have walked down the Tayelet in Tel Aviv on a Thursday afternoon and you’ve seen the people leisurely lingering in cafes as the waves of the Mediterranean crash in the background. But for many Americans, the only images of Israel that they see are of blown out clubs and cafes, missiles firing, death and tragedy. That in itself is a tragedy. These news stories often miss the beauty and the human element of why our nations care so much for one another. But, these stories do serve as a constant reminder of the threat Israel faces, and why Israel needs our friendship. Asher Afriat needs no reminders. Asher is a friend to many of us, and he’s here tonight. He owns a travel company in Israel, and leads many of the AIPAC tours. Several months ago, when rockets were flying over Israel, Asher sent me an email. He was up early in Tel Aviv, on his way to pick up some tourists. He saw some young reservists with packed military bags waiting to be picked up. He yearned to drop everything and jump in the truck with them. As he drove, his favorite radio station was interrupted by Code Red Alerts. Yet for me, that moment of Asher’s reflected the true essence of Israel with all its pain and beauty. We are here together tonight, people of all faiths to support Israel and the US-Israel relationship. So, to all our Christian brothers and sisters who are with us, we salute you and we thank you for standing with Israel. Thank you for standing with us to defend the gift that is Israel. Israel is a gift to all free loving people around the world. The Jewish people know and realize this gift better than anyone. The creation of the modern state of Israel had a special effect on what it means to be a Jew. Before 1948, we Jews often had difficulty defining ourselves publicly, and instead we were defined by stereotypes. The craven hook nose man counting money behind closed doors. Secretive. Untrustworthy. The caricatures were ugly, and unfortunately some still linger. But after Israel was created, people around the world began to see something else. They saw farmers, and warriors, and creative souls. They saw innovators, scientists and chemists giving back to the world and saving lives. The survival of Israel and what it says about its Jewish and Arab citizens is a bulwark against ever returning to the days of being the eternal outsider – the wandering Jew. Throughout my entire political life, I have never known a time where I have questioned America’s resolve and support for Israel. I have never questioned America’s historic support for the little guy against the bully. I have never questioned the role we play as protectors of liberty and defenders of justice. Until now. It is only recently where I have begun to worry. I worry that some of our nation’s leaders are complacent. I worry that some in Washington think we must retreat to our domestic politics and reduce focus overseas. I worry that in the pursuit of comity with Israel’s foes, some will seek distance. I worry that they indeed overlook the gift that is Israel. And I worry that Israelis worry. And these worries are not unfounded. Israel’s under attack. A while back, I received a briefing in Israel from one of the engineers of the Iron Dome system. His name was Avi Sacher. Avi’s presentation was impressive. He demonstrated through slides and video the precision and agility of the anti-rocket defense system. Avi beamed with pride as he explained how countless lives were saved by the Iron Dome technology. How families were spared despite deadly rockets aimed at their home, and how mothers were relieved to see their children safe while sirens wailed at terrorists’ rockets overhead. Five days later, still in Israel, I met with Avi again. His enthusiasm was gone and there was pain in his eyes. He spoke with great emotion as he told us of the one rocket that had gotten through. It somehow slipped past the defense system, hitting the town of Be’er Sheva, and killing an innocent Israeli. He was tortured by that experience. And Avi went back to work, determined to perfect the system that had already saved countless lives. The importance of the Iron Dome’s capability was driven home again recently during the conflict in Gaza. The Iron Dome has to be right 100 percent of the time, or Israelis die. As important as they are, defensive systems like Iron Dome, David’s Sling, and the Arrow are not panaceas. True peace will require an end to Iranian backed weapons smuggled into Gaza. It will also require a recognition by Hamas and the Palestinians that violence does not help, but hurts their cause. Only when Palestinians lay down their arms, can we hope to achieve peace. My message to you tonight is this: Our enemies know that if they divide the United States from Israel, they will defeat Israel. And they will be one step closer to defeating America. That is their goal. That is their mission. And we must not ever, ever let them succeed. Just listen to President Ahmadinejad or Ayatollah Khamenei speak anywhere at any time and their intentions are clear. Iran is a direct and immediate threat to Israel, to our allies in the region and to the civilized world. But, some in Washington hold the view that Iran is all bluster. That Iran can be contained and negotiated with. But that impression is wrong. We need to be clear-eyed that the nuclear talks with Iran cannot be unending, and that they may fail. We need to recognize that military action against Iran may become necessary to protect America, Israel and our allies. America must be prepared to lead from the front. And the challenge should not be Israel’s alone to bear. In Syria, tens of thousands of people have been brutally and relentlessly slaughtered by an evil dictator intent on massacring his people. Our hearts ache as we see mass graves, all too familiar to us Jews. But, Syria is not just a moral challenge, it’s a strategic challenge. The United States cannot and should not stand aside and let the chips fall where they may. We’ve got to be on the side of those looking to end Assad’s tyranny. We cannot guarantee that those who succeed him will be greater friends to our nation or Israel, anymore than Assad was. But without action, we can guarantee that more innocent lives will be lost. We will have failed to shape the outcome of this conflict. And we will guarantee that Syria’s future leaders will not have known the helping hand of America when the Syrian people so desperately needed help. Beyond just Syria, the entire Middle East is in an epic state of political transition and uncertainty. The stakes could not be higher. When there is no American leadership; there is no leadership. Bottom line, Israel’s security goes hand in hand with America’s security. And, America’s security depends on freedom and democracy growing and open societies hearing our message. America’s security depends on putting a stop to the bullying on the world playground. To all of you here tonight at AIPAC, the future depends on your voice. It must be heard on Capitol Hill and it must be heard by this Administration. It must be heard around the world. We must now and forever stand with Israel, or we risk losing the great promise of America. “We gather tonight recognizing that Israel’s existence is testimony that faith and courage can triumph even in a cauldron of enmity, terror, and constant threat. “Israel’s history is that of a courageous people’s perseverance against injustice from one generation to the next. It is a history Americans understand and look to for inspiration. “The State of Israel, though besieged by forces of hatred, intolerance, and extremism, has never abandoned its founding principles nor lost sight of its historic mission – to provide freedom and sanctuary in a democracy for the Jewish people in their ancient homeland. “Some of my proudest moments as a Member of Congress were working with many of you to help Soviet Jews emigrate from behind the Iron Curtain to reach that freedom and security in the land of their ancestors. “In January, we lost a dear friend and a passionate advocate in Ambassador Max Kampelman, who was instrumental in that effort. I was Chairman of the Helsinki Commission at the time, and Max was leading the negotiations with the Soviet Union on arms reduction and human rights. “Max may no longer be with us, but his legacy of linking human rights to international security is a practice that can serve us well today. The safety and prosperity of democracies such as Israel, which promote freedom and individual rights, advance America’s national security interests. “Today, we continue to fight for what Israel represents: an outpost of freedom in a region where democracy struggles to take hold with no guarantee of success. From Tahrir to Tripoli, from Aden to Aleppo, America and Israel will remain vigilant and work to ensure that legitimate yearnings for democracy are not hijacked by extremists. “And nowhere must we be more united and vigilant than when facing the threat posed by Iran. The stakes have never been higher. “If there is one lesson we have learned about the Middle East in recent years, it is that nuance is not only not effective but can be dangerous. We must speak with unambiguous clarity: the United States will not accept a nuclear-weapons-capable Iran. They must know our clear intent and firm commitment. America and Israel cannot leave any uncertainty in the minds of those who describe us as their common foes. “Let there be no doubt that it is in America’s direct interest to keep Iran from developing a nuclear weapon. A nuclear Iran would set off an arms race in the region, pose a clear and present danger to American troops stationed in the Middle East and Europe, and threaten Israel’s very existence. “As nuclear talks with Iran continue, still without result, Iran’s leaders must understand that these talks cannot go on indefinitely. Let me repeat this point, because it is critically important: the day will come when diplomacy ends. And Iran’s leaders will ultimately decide whether it is because they have willingly dismantled their nuclear weapons program or whether they have compelled the free world to do it for them. “The threat from Iran comes not only from its nuclear ambitions but from its long history of state-sponsored terrorism across the globe. A nuclear-armed Iran would be even more aggressive in sponsoring its deadly agents of terror – Hamas and Hezbollah – and proliferating its weapons of mass destruction. “There are some who say that Hamas and Hezbollah are simply politicians. Make no mistake: they are terrorists. “The threat Hamas and Hezbollah pose to Israel and to the Jewish people is chillingly clear. “And so, like any sovereign nation, it is Israel’s right to take such steps as are necessary to defend itself and its people. It is not only international norms that give Israel that right but the hard lessons of Jewish history. “Doing so is not only the work of God but for our generation, which must continue to strengthen and fortify the relationship between Israel and America. “Thanks to the work AIPAC performs on Capitol Hill and around the country, Congress’s support for Israel has endured and grown stronger each year. The bipartisan nature of Congress’s support makes it ever more clear to those who would do the Jewish State harm that Israel is here to stay – and will never, never stand alone. “One direct result of America’s commitment to Israel’s security is Iron Dome. I hope you will join me in thanking again the operators of Iron Dome for protecting Israel’s border communities. “But America’s ties with Israel run far deeper than matters of security and statecraft. The United States, a young nation, and Israel, heir to an ancient birthright, were founded on the same values. These are the principles of human dignity and basic justice first laid out in the Torah and embraced by America’s Founders. A line connects the wisdom of our shared scripture to the hearts and minds of those who wrote the Declaration of Independence, the Constitution, and our Bill of Rights. “Jewish history is and always will be intertwined with American history. And from helping to draw back an Iron Curtain to constructing an Iron Dome, it has been the privilege of my life to work with you to shape that history. “And, with clarity in our common cause, with the courage to pursue our common commitment, we must face our shared challenges with an iron resolve. Such is AIPAC’s legacy and our enduring mission: to ensure the survival and success of Israel – and the safety and security of its people – in our generation and for every generation yet to come.